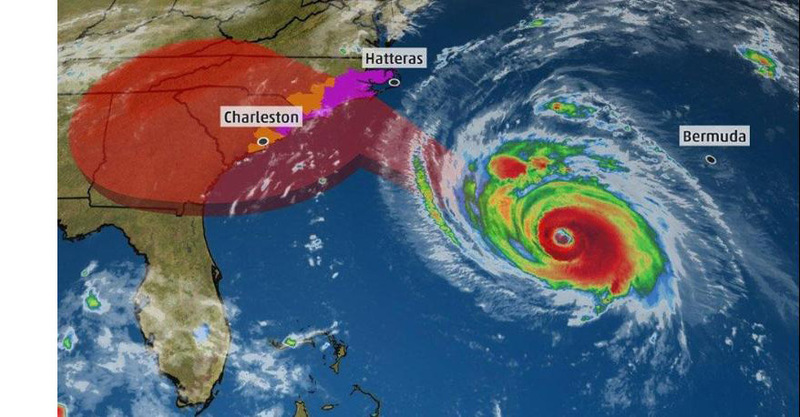 With the imminent impact of Hurricane Florence facing many properties in North Carolina, South Carolina and Virginia later this week, we want to make sure you are aware that Buyers Access is here to support and assist you and your teams in every way possible. If needed, our team can help with finding contractors, placing emergency orders, locating unobtainable items, and act as an extension of your team during this demanding time. 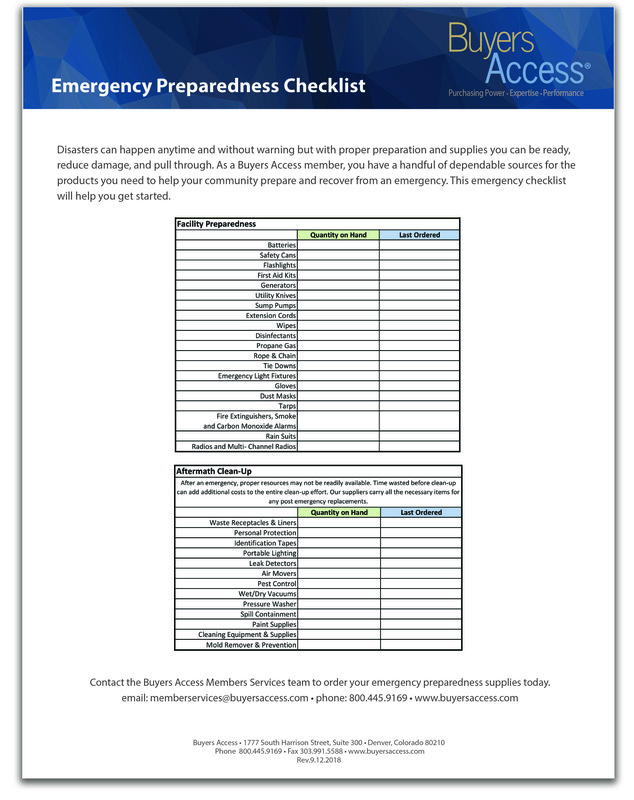 In addition to many of the great recommendations in the Red Cross hurricane preparedness link below, here are a few additional tips to help prepare your properties for Hurricane Florence. If residents are staying they should be urged to fill their tubs with water in the event that they lose city/county water. Another resource available in the extreme event of needing rescue is the Cajun Navy. If cell service is not working and/or you cannot get through to 911 you can click on the web link below to submit for a rescue with the Cajun Navy. (Denver, 9/11/2018) – Buyers Access (BA) announced today a partnership with Ancillary Services Management (ASM), industry leading experts for professionally negotiated and managed ancillary programs in multifamily rental housing. Through this partnership, BA members will have the ability to maximize ancillary revenue opportunities, and the expertise available to help locate new amenities and services, manage existing contracts, and increase returns from ancillary agreements. ASM locates, negotiates, executes and manages ancillary services contracts including but not limited to, ATM machines, telecom services, smart home solutions, laundry services, and many more. ASM works to improve contract terms, provide new streams of revenue, and help avoid costly renewals. Ancillary Services Management (ASM) founded in 2003, is the premier ancillary service management company whose commitment to its clients is to increase their revenue, save them time, and provide quality services to communities and their residents. ASM offers professionally negotiated and managed amenities and ancillary services, resulting in improved efficiencies and consistency in our client’s ancillary programs. ASM’s newest service is FoliEdge, a web based contract management platform that provides visibility into a company’s service and provider agreements. With FoliEdge, a company is able to organize and manage the information related to their portfolio's properties, agreements, payments associated with those agreements, providers and services. For more information visit ASMadvantage.com, or contact Karen Summers at 866-934-3108 x15. Denver, Colo., September 10, 2018 – Buyers Access is pleased to announce the addition of Xenia Diniz as Sales Director, located in San Diego, CA. In this new position Xenia will direct all sales activities for the Western U.S., leveraging off her 20 plus years of commercial and multifamily industry experience growing, building and developing client relationships. Xenia has a proven history helping her previous organizations accelerate revenue growth, and should quickly become accretive to the continued success of the Buyers Access sales team. Prior to joining Buyers Access, Xenia served as a Commercial Real Estate Associate with CoStar Group, where she analyzed commercial real estate data for business and income growth opportunities, and sold, trained and educated clients on CoStar’s commercial real estate system. Prior to CoStar, Xenia served as Regional Sales Manager for Lease Hawk, selling performance management solutions (SaaS) to C-Level executives. Previous positions included Market Sales Manager for RentPath, LLC., and Account Executive for Apartment Guide. “I am excited to be part of a company that provides a service with clear and immediate value but most importantly cares for its team and clients,” said Xenia Diniz, Director of Sales, Buyers Access. Xenia earned a Bachelor of Science in Business Management and Marketing, University of Phoenix. She also holds a Certificate of Real Estate, Finance, Investments and Development, University of San Diego, California. Friendly reminder we will be closing early today at 3 PM MST and will be closed on Monday, September 3rd. 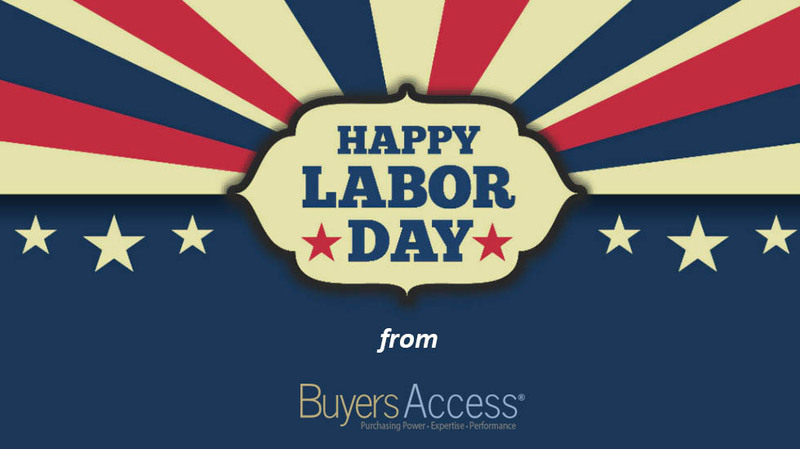 Enjoy your holiday weekend, and remember to be safe! Preparing for your regional quarterly meetings? Pre-planning and budgeting discussions for 2019? Student Housing Planning – Post-Turn? Looking for ways to cut product spend and increase transparency? 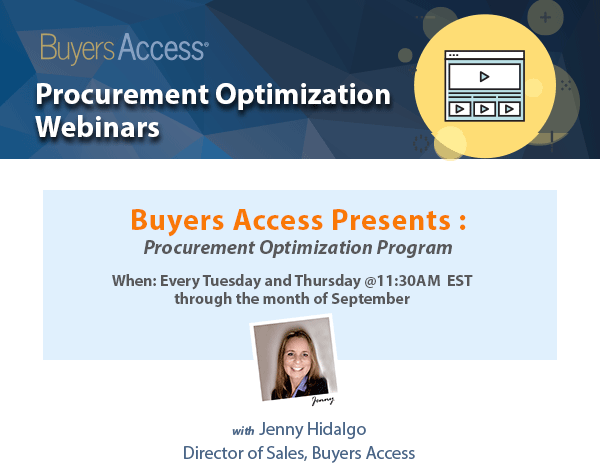 Join us and learn more about how Buyers Access can optimize your purchasing. Register for the webinar and be entered to win $500 Visa Gift Card. • Webinars will occur two times a week on Tues and Thurs at 11:30 am EST through the month of September. • You will receive a calendar invite and your chance to win. • You must register, attend the webinar, and take a short survey in order to qualify for the drawing! • You will only get to register for the drawing once and we will announce the winner on September 30, 2018. Mississauga, ON - August 7, 2018) – Pioneering Technology Corp. (TSXV: PTE; OTC: PTEFF), (“Pioneering” or the “Company”), a technology company and North America's leader in cooking fire prevention technologies and products is very pleased to announce a strategic partnership with Buyers Access (BA) of Denver Colorado. BA is the leading provider of purchasing optimization services and customized purchasing solutions to the multifamily industry in the United States, serving more than 600,000 housing units nationwide. As part of this partnership, BA will deliver targeted marketing programs centered around cooking fire awareness and work directly with BA member owners and operators to promote Pioneering’s SmartBurner as a cooking fire prevention solution. According to the National Fire Protection Association (NFPA), cooking fires are responsible for 74% of multifamily housing fires annually and are also the leading cause of cooking fire related injuries. Pioneering’s product solutions, including its best-selling SmartBurner with patented temperature limiting control (TLC) technology, help prevent cooking fires before they start. About Pioneering Technology Corp.: Pioneering Technology is an "energy smart" technology company and North America's leader in innovative cooking fire prevention technologies and products. Our mission is simple: To help save lives and property from the number one cause of household fire – cooking fires. We do this by engineering and bringing to market energy-smart solutions that make consumer appliances safer, smarter, and more efficient. Our patented cooking-fire prevention products address the multi-billion-dollar problem of cooking fires. According to the National Fire Protection Association, stovetop cooking is the number one cause of household fire and fire injuries in North America. Pioneering’s patented temperature limiting control (TLC) technology is now installed in over 250,000 multi-residential housing units across North America without a single cooking fire being reported, delivering peace of mind and a solid return on investment for its customers. Pioneering’s proprietary cooking fire prevention solutions include Safe-T-element, SmartBurner, SmartRange, RangeMinder & Safe-T-sensor and are suitable for the majority of the more than 140 million stoves/ranges and over 140 million microwave ovens in use throughout North America. For more information, visit www.pioneeringtech.com. How are you doing as a company when it comes to these six critical areas of optimizing Procure to Pay operations? It all begins with good data. Are you receiving the data necessary internally or from suppliers to make prudent and well-informed decisions? Quality timely data is the foundation for a successful procurement optimization strategy. Well defined and communicated policies must be established to ensure your organization is strategic in its sourcing efforts. How do you communicate and train in the most effective manner? Strategy and policy must be adopted cross-functionally across the entire organization. Many organizations are under staffed when it comes to a disciplined procurement process and personnel. What options are available to leverage other resources and to augment your people and results? External specialists help keep organizations focused on the core business tasks and to maximize profitability. Look closely at the operational design and organizational structure of the procurement function. Is your process clearly defined, documented and communicated? All things must be aligned so that people, process and technology are optimized toward efficiency. An effective e-procurement system can significantly improve process efficiencies. Do you utilize a defined catalogue or electronic invoicing? The proper technology solution(s) can eliminate paperwork, expedite contract fulfillment and control compliance. Companies must identify ways to monitor and measure purchasing in order to determine ROI. Can you benchmark your procurement results against industry standards or other owner/operators? ROI should be benchmarked against business objectives to drive cost containment, NOI enhancement and performance metrics management. Contact us today to learn more about how Buyers Access can optimize your purchasing performance. Come Talk to Us at the HAA Business Exchange on Aug. 2nd! Look out for Jenny Hidalgo at the HAA Business Exchange on Thursday and get to know more about how Buyers Access optimizes purchasing performance for owners and operators. View Come Talk to Us at the HAA Business Exchange on Aug. 2nd! Denver, Colo., July 20, 2018 – Buyers Access is pleased to announce the appointment of Ken Miller as Vice President of Sales, who brings substantial leadership experience to the Buyers Access Sales team, with over 34 years of experience in Information Technology, Process Improvement, and Multifamily Operations Management. 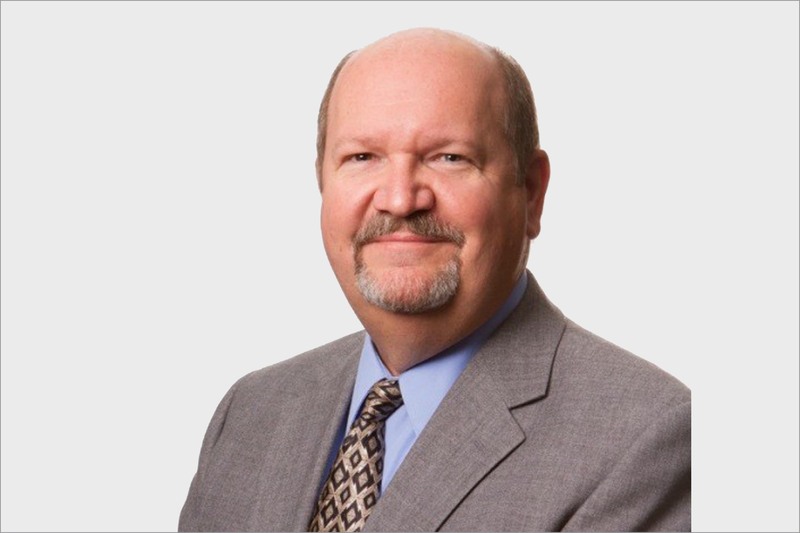 During his multifamily career, Ken has held COO, CTO, CIO, and VP positions with such firms as The LYND Company, CF Real Estate Services (formerly CFLane/Lane Company), Peak Campus, Rainmaker-LRO, Ambling Companies, Pinnacle Realty, and Insignia Financial Group. Ken previously spent 13 years outside of multifamily with Sara Lee Corporation and Southern Weaving Company. Ken’s background and management experience includes overseeing numerous departmental areas such as Property Operations, Human Resources, Payroll, Information Technology, Corporate Marketing, Corporate Training, Business Development, Technical Product Implementations, and Ancillary Services (voice, video, and data contract negotiations), Compliance, Construction Services, Corporate Accounting, and Property Accounting for Conventional, Affordable, and Student Housing management platforms. “Ken’s past experience and leadership is a natural fit to continue building upon the substantial foundation established by our sales team, and to facilitate further escalation of our current upwards sales trajectory,” said Dan Haefner, President and CEO. “I am honored to be a part of the Buyers Access leadership team and excited to assist our stellar sales team in promoting Buyers Access’ Purchasing Optimization Services and Data Analytics,” said Ken Miller, Vice President of Sales.